Your responses in this survey can help your school improve student health on campus—and you can win prizes! 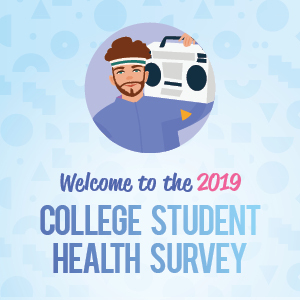 The College Student Health Survey was designed by Boynton Health to give post-secondary institutions a comprehensive look at the health of their students. School participation varies each year. Students from participating schools are randomly chosen to take this survey. Participation is voluntary, but greatly appreciated. The information gathered from this survey is used by colleges and universities to better understand the health of their students, and prioritize school resources to improve the student learning experience. An email with a unique link (for your use only) to the survey will be sent to your school or personal email account. The only way to take the survey is to click the link in your email. Can’t find the email? Check your spam folder. Reminder emails with the survey link will also be sent. The survey takes about 20-25 minutes to complete. And your responses are completely anonymous. If you need technical help opening the survey, please email cshs@umn.edu. Complete the survey by the deadline: noon on Friday, March 29, 2019, to be entered into a grand prize drawing for an iPad Pro, or a $500 or $250 Amazon gift card. One student from each school will have the additional opportunity to win an Amazon $100 gift card. Your chances of winning a prize are better than 1 in 600! Winners will be notified via email by Friday, April 12, 2019. Do you have questions about the survey? Please contact the survey administrator: Katherine Lust, Ph.D., Boynton Health, University of Minnesota: lustx001@umn.edu or 612-624-6214.